Spring is finally here and what does that mean to Sub Sea Research? It means the start of the fifth season for the crew of the M/V Sea Hunter’s quest for the Port Nicholson. 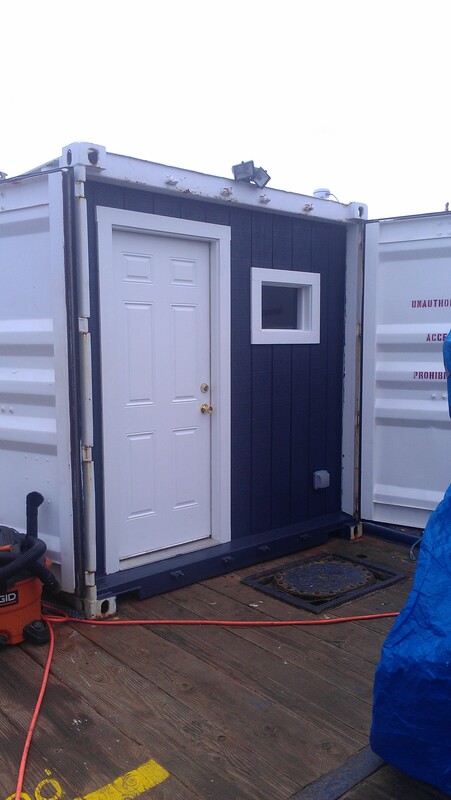 After a long cold winter sitting on the dock in East Boston, maintaining the ship and working out a new plan of attack the crew made their first trip of the season to the site. Mother Nature gave them three decent days of weather and that was all they needed. Greg loaded the ship with groceries and supplies while the crew prepared for the mission. The first trip of the season is always filled with a bit of anxiety as well as excitement. After the ten hour ride to the site everyone was pumped and rearing to go. The purpose of this trip was to check on the buoys and anchors and to hopefully get some footage inside the ship using one of our rov’s (remotely operated vehicles). Kevin LaChance is the company’s rov pilot and runs all the missions along with Brian Ryder and Alex Bezkorovainy. The three of them spend the majority of their time at sea working inside a conex box that sits on the deck of the Sea Hunter. The space is outfitted with specialized equipment that allows them to control and view every movement of the rov while it’s underwater. Throughout the winter months, Kevin spends numerous hours on a computer simulated program preparing and honing his skills. Once the rov is lowered into the water it is up to Kevin to control it’s every movement. 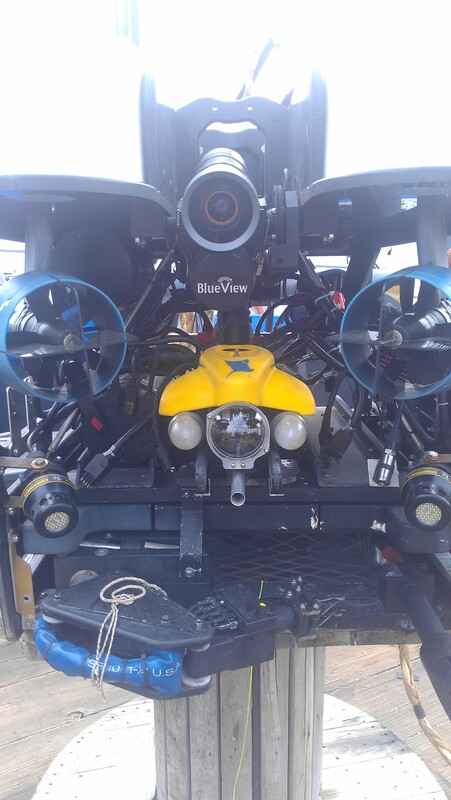 Rov’s are complex pieces of equipment and come in many different sizes and strengths. Some are equipped with special devices that help with a specific mission, such as manipulators, claws, baskets and video cameras. The crew of the Sea Hunter are constantly working and creating ways to make it work more effectively and efficiently to complete the mission. Once at the site and preparing for the mission, it was apparent that our larger rov, the M5 was not working to full capacity, so they decided to use the Video Ray which is our smaller rov. The crew has a nickname for it, the Doolittle. The first mission started out fine but when the current picked up it quickly ended. This is always disappointing when your mission cannot be completed, but then again, better safe than sorry. When the next slack tide occurred it was decided to try again. As they lowered the rov into the waters things were looking good. The Doolittle slowly made its decent down to the 650’ depth with little ease as Kevin strategically maneuvered the joy stick. As it approached the Port Nicholson everyone held their breath as Kevin seamlessly flew the rov inside the intended cargo bay. 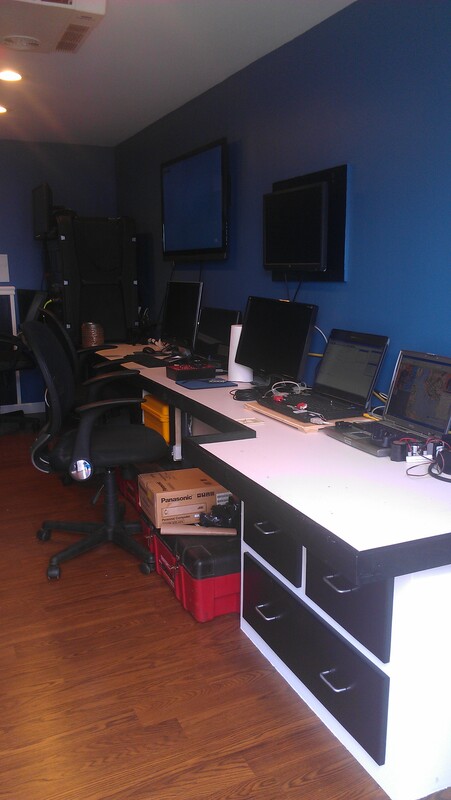 Once inside, all eyes above were staring at the monitors looking at the enclosed area through murky waters. On previous trips I remember straining my eyes hoping I would be the first one to see something of significance. Believe me, it’s not as easy as it seems. It wasn’t long before the tide once again started picking up. It was causing the umbilical cord to tangle as the current was tossing the rov around. It was quickly decided to abort the mission to ensure no damage is done to the rov. Though a bit disappointed they didn’t have more time it was considered a good trip. Buoys and anchors were all set, they got footage inside one of the cargo bays and it was only their first trip out. As they left to return back to port, spirits were high as they discussed their next mission. Cindy, great update by you on SS Port Nicholson salvage operations. . Wishing, you, Kevin, Greg & the whole crew the best of fortune throughout this Spring and Summer. Thanks Bill, Yes its been a long winter and the guys are at their best when they are on the site. Hoping for a weather window soon as they are ready to get right back to it. Hope all is well with you and stay positive, this is the year!